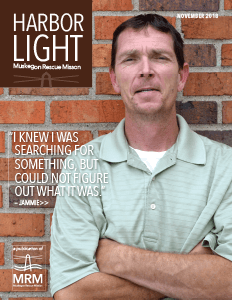 Muskegon Rescue Mission is the largest provider of continuous emergency shelter services in West Michigan. Since 1907, food, shelter, clothing and spiritual direction has been provided to men, women and children experiencing homelessness. When a guest arrives at the Mission, we immediately address their physical needs. Once a guest’s physical needs have been met, we are then able to address the root cause of their distress and offer the spiritual nourishment necessary to effect true and lasting change. Our objective is to bring people to a saving knowledge of the Lord Jesus Christ, thus bringing them to dependence upon God and independence within society. Breakfast, lunch, dinner, showers, clothing, chapel services, case management, as well as health screenings, are just a few of the services provided to all mission guests. Counselors are on staff at both shelters for our guests. Both our men’s and women’s shelters offer a wide variety of services for our guests staying with us. Every guest gets individualized case management which helps with housing, disabilities, veterans, health insurance, and other needs. Guests attend life skill classes such as money management/budgeting. We provide our guests with job training opportunities that help to build their resumes. These job opportunities include working at one of our three MRM thrift stores or training on the overall operations of an industrial kitchen. Anyone who is in need of a meal is welcome to eat at our men’s or women’s shelter. We serve three meals a day, every day of the year. Anyone who is in need of food, even those who are not staying at one of our shelters, are welcome to be part of our food pantry ministry. We also help those in need in our community by offering gift cards to our three thrift stores to get clothes when needed. Located at the Men’s Shelter every Thursday from 9:30 am – 10:30 am. Located at the Men’s Shelter every Wednesday from 9:30 am -10:30 am.